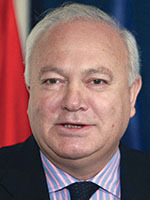 Miguel Ángel Moratinos Cuyaubé is a former Minister of Foreign Affairs and Cooperation of the Kingdom of Spain and EU Special Representative for the Middle East Peace Process. the Mediterranean is a thousand things at once. Not one landscape but innumerable landscapes. It is not one civilization, but a number of civilizations, piled one on top of the other [...]. The Mediterranean is an ancient crossroads. For millennia all has coalesced in it, complicating and enriching its history. Throughout its long recorded history, the Mediterranean basin has been the stage upon which has unfolded an almost inexplicably singular diversity coupled with numerous contradictions: peace and war; ethics and aesthetics; passion and reflection; love and hate. Indeed, the Mare Nostrum has always been immersed in such harrowing existential dualities. Today, however, its many challenges are more than ever before made manifest in violence and upheaval, reminding us not only of the importance, but also the relevance, of this geopolitically critical region. The good news is that the Mediterranean is once again at the top of the contemporary international agenda. It is no longer a forgotten sea. Unfortunately, it has come back into the global spotlight tangled up in human dramas, economic inequality, violent clashes, and cultural and religious exclusions—that is to say, the Mediterranean basin has come back into the news through a deep dehumanization of its plight. Today, the Mediterranean is again going through a tumultuous time in its history, with everything seeming to suggest that the decades ahead will bring it hard and troubled times. That is unless, of course, the Mediterranean demos itself rebels and realizes that the time has come to rebuild a space of peace, security, and prosperity. In this essay, I will first analyze the region’s major ongoing security and coexistence challenges, as well as its economic inequalities, social and human conflicts, and cultural and religious misunderstandings. I will then put forward potential solutions, which I hope may reinvigorate hopes for a Mediterranean renaissance that could ensure a better life for all its inhabitants.